US commentator Jeff Nyquist doesn't mince words. Here is an abridged version of his take on the looming war in the Middle East. The Syrian army has been mobilized and is digging defensive positions. Syrian military leaders have been meeting with Iranian military leaders to coordinate war preparations. The Russians and Chinese have been sending significant arms shipments to Syria, including advanced MiG-31 fighters, Chinese-made C-802 anti-ship missiles, Metis-M and Kornet anti-tank missiles (used to stop the Israeli offensive in Lebanon last year), and sophisticated anti-air missiles. A new generation of Russian weapons, fielded after the “collapse” of the Soviet Union, have strengthened Syria’s overall military position. It is not that Syria can defeat Israel in a ground war. It is a question of improved attrition capabilities. The Israeli military has a low tolerance for attrition. The Syrians seem to expect an attack on their country. The Syrian government is allegedly moving sensitive state archives out of Damascus. Rockets are being sent to the Hezbollah militia in Lebanon. What is going on? Is a major terrorist strike being contemplated against Israel? Will this strike involve chemical, biological or nuclear weapons? Will this strike implicate Syria? Without a simultaneous Egyptian attack on Israel from the south, Syria cannot successfully make war on Israel from the north. And yet, Syria feels that war is coming. It’s as if the Syrians know something is going to happen. Iran and Syria may be militarily weak compared to Israel and the United States, but political cracks have appeared on the U.S. side. Washington may prove helpless. The Middle East is a powder keg, ready to explode. The Israelis and the Americans want peace. But every olive branch has proved a snare. The Syrians and their Iranian allies want blood. And blood they shall have. The Bush administration says the Syrians are “fueling the war in Iraq.” The Iranians are doing the same. Iran and Syria have a mutual defense pact. Both are being supplied with Russian and Chinese weapons, and both are expecting a war by the end of summer. How will the war start? Perhaps it will begin with an American preemptive strike against Iran’s nuclear weapons program. Perhaps the troop surge has convinced them of Bush’s aggressive intentions. But the troop surge has proved disappointing. More likely, the Syrians and Iranians think that Bush is politically crippled and incapable of a major offensive. If the Bush administration were consistent and logical, and completely contemptuous of public opinion, then an attack on Syria and Iraq could occur. Some have argued that President Bush is actively preparing for a wider war in the Middle East. But this is doubtful. The strategy of Iran and Syria, like the strategy of Muslim terrorists, is manipulated by Moscow and Beijing. It is Moscow’s timetable that carries the most weight. Moscow supplies the needed weapons, and the intelligence assessments. According to the late Alexander Litvinenko, a former KGB officer assassinated by Russian operatives last November, Moscow wants America to be bogged down in a Middle East war. Top leaders in al Qaeda are Russian agents. The Russians trained many terrorist leaders in Gaza and the West Bank. And Russia is well served by growing violence in Lebanon. Middle East conflict keeps oil prices high, and that makes money for oil-rich Russia. The American economy is thereby weakened. War is a good thing for powers that seek to exploit trouble. And Jeff Nyquist ? Couldn't you find someone with a litle more credibility ? This guy worked for WND and we 've all heard about their rigid editorial policies (http://www.wnd.com/news/article.asp?ARTICLE_ID=53327). Why would you take seriously anything the BBC reports regarding Israel? The BBC refused to release it's own study on it's Israel reporting. The BBC went to court to block it's release. I wonder why? Actions speak louder than words. The report you linked to is typical BBC nonsense. Nobody in Israel except for a few far-left academics is considering returning the Golan to Syria under any circumstances. Olmert denied the rumor that he offered the Golan in return for a peace treaty. Unlike Judea, Samaria and Gaza the Golan has been annexed and is part of Israel. The offer that Barak made in 2000 to return the Golan to Syria for a peace treaty had to be approved by a voter referendum. Voter approval was doubtful then but Syria refused the offer. After the Arab response to Israel leaving Lebanon and Gaza the land for peace formula is effectively dead. I don't think the BBC is perfect but I have to say that I think it's one of the better media outlets out there and that most of the criticism it recieves tends to come from Americans. Most US citizens tend to have quite a hawkish view of the conflict and perhaps even the region, the BBC if it is biased and it can tends to represent a European view which is why it sometimes angers some US or Israeli commentators. Depends what you mean by annexation, Begin refused to call it that and its status and severability varies from government to government. What's interesting though is that the piece of legislation used, doesn't use those terms and perhaps tellingly the GH Law was passed normally instead of as a Basic Law. So interesting degree of ambiguity which may even be what Israel intended. I think on the issue of whether Israelis are prepared to give it up there is probably a great deal of disagrement, but it is really the only concrete grudge the Syrians have against Israel. 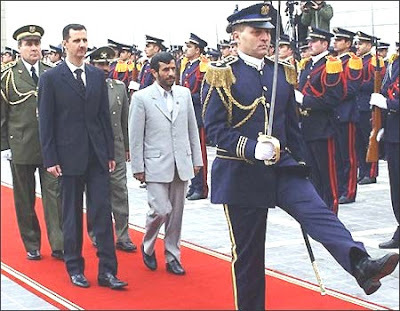 One even suspects that ideological reasons are waning, Bashar is much less Nasserite than his father. I'm not sure, I think that Syria would be infinitely stupid to risk it now as that would only reinforce greivances and scuttle any negotiations (peace, recognition etc) such as those that have been going on under the auspies of the Arab League. But that said it has done some stupid and nasty things in the last few years. Here's hoping they calm down. You know what fergus, this is who you are. You are rooting for the Soviet cause and you're its Useful Idiot. "They [anti-Communists] will be attacked as reactionaries, bureaucrats with outworn ideas, political or religious Cold War warriors, spoilers or just fascists. The attack will aim to neutralise them by ridicule and to turn them into an endangered species." (pg. 32) of The Perestroika Deception. Shows what a Useful Idiot you are fergus whenever you go about and deny Golitsyn's warnings, but have the gall to ridicule anyone who believes in them. Fergus said "I think on the issue of whether Israelis are prepared to give it up there is probably a great deal of disagrement, but it is really the only concrete grudge the Syrians have against Israel." The Golan was formerly annexed in 1981. There is no ambiguity to the annexation. It is legally as much a part of Israel as Tel Aviv and united Jerusalem. The Israeli electorate overwhelmingly favors not trading the Golan for a peace treaty. The Israeli government cannot trade the Golan without voter approval. Realistically speaking, which is what the BBC doesn't do when reporting from Israel, there is no chance that Israel will give up the Golan. You say the Golan is Syria's only concrete grudge against Israel. Totally wrong! Official Syrian state Baathist ideology is that Lebanon, Israel and Jordan were wrongly taken from Greater Syria when the British and French decolonized the region. Every Syrian schoolkid is taught that Palestine/Israel belongs to Syria. All of Israel not just the Golan. But this reality is inconveinently not reported by the BBC. The text is I think, ambiguous. It doesn't use such concrete language as the Jerusalem Basic Law (though I do think they are of different stature) for example and any explicit mention of sovereignty or annexation is absent though it does use jurisdiction . I don't think we're going to agree on this, its debteable. It may not even be that important. Annexation I think would be reversible if necessary. Enough law, as for the politics, yes if it happens it won't happen soon. The government could however do it if it wanted, I'm sure you know how fractious, confusing and malleable Israeli politics is. For one thing Barak is back in as chief of the Labour Party and history seems to show that Israeli voters consider quite a broad range of issues in voting. It wouldn't be popular or approved by the majority of the public but it wouldn't necessarily bring down a government (consider the flexibility and range of parties and coalitions in the Knesset in the past) or cause that party a severe defeat come the next election. As Gaza and Oslo and Camp David showed these decisions are not made be referendum. I recognise that the consquences of these decisions are huge but I dont think it affects the process by which they are made. Mah, see the Hamas thread for my reactions. And yes WND is a joke, consider the range of paranoia, Biblical revivalism and the horrendous look of the thing (ah my superficiality). "Mah, see the Hamas thread for my reactions. And yes WND is a joke, consider the range of paranoia, Biblical revivalism and the horrendous look of the thing (ah my superficiality)." When have I ever used WND as a source? Can you please name one time? I wasn't referencing it as a source just commenting on Nyquist previous tenure there, ie to call into doubt the tenor of the original article. I presumed you were bringing me up on shooting Nyquist down, sorry if i was mistaken. Chavez is now openly aligning himself with Ahmadinejad who supports these terrorist groups in Lebanon, in Gaza and even the "moderate" one in the West Bank. I believe it was dumb for the CIA to reveal that it was spying on Castro sympathizers in the U.S., because it only gave the opportunity for Western Communist parties to literally attack the U.S. with it. Now with Castro's protege Hugo aligning himself with his buddies in the Islamo-Nazi Republic of Iran, I can't imagine why the CIA would keep such records of folks during the 60's and 70's. Er, maybe it had do with Castro's involvement in international terrorism? Israel first occupied the Golan Heights for strategic reasons following a war in which Syria (along with other Arab nations) mounted an unprovoked invasion of Israel. The Golan Heights had previously been used by Syrian regulars and Arab irregulars to lob bullets, shells and rockets down the slope into the Israeli kibbitzim and villages erected on Israeli soil. To put a stop to this by retaining the Golan Heights was only commonsense. And if you mount an unproved attack on someone you have only yourself to blame if they [a] retaliate; and [b] penalise you in some manner. Before you make issue with the mote in your neighbour's eye,check the stone in yer own...or words to that effect.Would you guys be any different from the factionalised Arab/Jewish leadership if the chance arose? Not if your respective stances in any way reflected your utterances. By the way,any unbiased listener to the BBC would soon spot their alarming tendency to denigrate any Israeli initiative and to ignore the facsist behaviour of some of the Arab powers.However,and sadly,that's just the way of most European liberal media.So that makes it alright,doesn't it?